They demonstrate using the system to track moving targets and using the rifle to shoot around corners from a concealed position using an external display. Austin TX based applied technology company TrackingPoint™ released a video in August of shooters running a professional course at Texas' Rifles Only with their Smart Rifle™ system. The video showcased shooting unsupported, shooting at extreme angles, shooting multiple unknown distance targets in rapid succession, and also the ability for the TrackingPoint system to shoot from cover using their streaming video technology. It wasn't long before the capabilities were picked up on by noted firearms press, who initiated an online debate about the Law Enforcement applications and corner shot capabilities of TrackingPoint smart rifles. The Firearms Blog noted "They demonstrate using the system to track moving targets and using the rifle to shoot around corners from a concealed position using an external display, much like the Israeli Corner Shot pistol system. Very nifty!" The Truth About Guns reported "The guys at TrackingPoint have just realized that their tethered iPad feature will basically allow them to “remote operate” one of their guns. Your finger still needs to be on the trigger, but much like the periscope rifle of yesteryear you can fire from behind cover"
Precision Guided Firearms™ (PGFs) employ target tracking, a Heads-Up Display, and advanced fire control technology to amplify shooting precision at long range by eliminating the most common sources of shooter error, including aim, trigger jerk, and shot setup miscalculation. They are commonly regarded as the best rifles ever created. Regardless of skill level or experience, PGFs significantly increase first shot success probability when compared to traditional technology, even at extreme ranges of 1,200 yards or more. 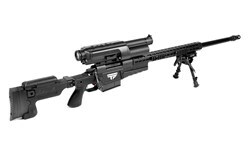 More than just a scope, PGFs are fully integrated systems based on standard caliber bolt action or semi-automatic rifles with a Networked Tracking Scope™, Guided Trigger™ and precision conventional ammunition. Onboard wireless technology allows PGFs to connect with local and wide area networks to deliver voice, video and data to mobile devices and various communication networks. These technologies allow shooters to be more accurate, engage multiple targets at unknown ranges quickly, track and engage moving targets, and communicate via command and control networks.